Finely crafted in the USA from North American Hardwoods. Sanded, ready to finish in either stain or paint. Call or submit a quote for custom size or species. Support countertop overhangs, and shelving or use as a decorative support under cabinets and wood hoods. 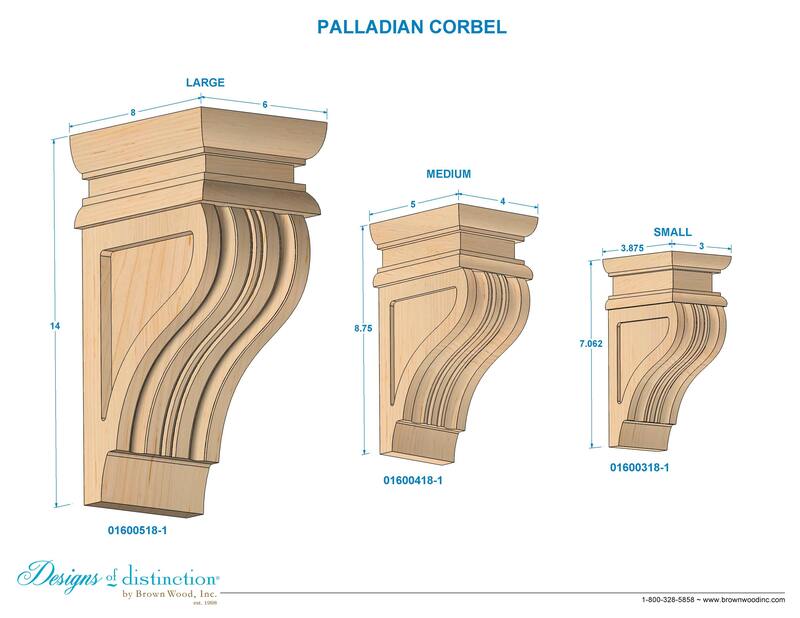 The Palladian Corbel is functional, providing support for hoods, shelving, cabinets, and more, and aesthetic with it’s elegant side and front carved details. Inspired by classic European design, the symmetrical and geometric details add just the right amount of decorative, yet functional, adornment. The polished Palladian Corbel is available in small, medium and large sizes, and 4 stocked species. Establish a theme using all wood components from the Palladian Collection. Available in multiple sizes - please check dimensions before purchase. Shop matching components in the Palladian Collection.